Leather bound for collectors, only 500 printed, signed, numbered, Mike Caro University (MCU) version. Classic Mike Caro book. Over 170 photos. Explains when players are bluffing, when they aren’t, and why. Determine the strength of opponents’ cards by their actions. For true collectors and investors, this is the leather-bound, limited-edition, signed and numbered, Mike Caro University of Poker, Gaming, and Life Strategy (MCU) edition. Never in the history of poker has one book made so much difference in how serious players approach winning. 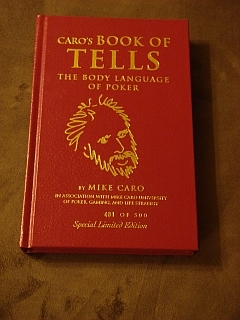 Mike Caro teaches you the science of poker tells with simple explanations that accompany over 170 photos. Highly collectible. Signed. Your individual number “of 500” appears in gold color ink on leather cover. Mike Caro says price will very likely go higher as supply decreases. The tells that Caro defines have stood the test of time and almost no serious player disputes them today. That’s because you will recognize these tells are ones you have broadcast yourself for precisely the reasons he explains! Leather-bound, limited-edition, signed and numbered.